Workers load ballots into machines at the Broward County Supervisor of Elections office during a recount on Nov. 11, 2018, in Lauderhill, Florida. Florida elections officials are racing to recount ballots this week after razor-thin voting margins left the state's marquee contests for the U.S. Senate and governor too close to call. Republicans took the lead in last Tuesday's elections, but their margins narrowed and state-mandated recounts were ordered after the processing of more than 8 million ballots cast. President Donald Trump is calling for the recounts to end, saying without evidence that Democrats are out to steal his party's wins in America's largest political battleground state. The drama, which has included dueling lawsuits and unsubstantiated allegations of electoral fraud, has evoked memories of the state's 2000 presidential vote recount where the winner of the White House hung in the balance for weeks before the U.S. Supreme Court stopped the counting and Republican George W. Bush triumphed over Democrat Al Gore. FILE - U.S. 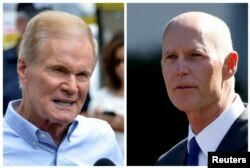 Senator Bill Nelson (L) speaks in Orlando, Florida, U.S., June 12, 2016 and Florida Governor Rick Scott appears in Washington, DC, U.S., Sept. 29, 2017 respectively. In the governor's race, Democrat Andrew Gillum initially conceded to Republican Ron DeSantis but now wants every vote counted. A recount also is under way for a state Cabinet post for agriculture commissioner in which a pro-marijuana Democrat holds the edge. 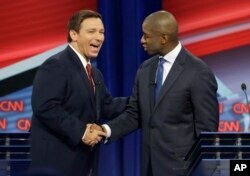 Florida Republican gubernatorial candidate Ron DeSantis, left, shakes hands with Democratic gubernatorial candidate Andrew Gillum after a CNN debate, Sunday, Oct. 21, 2018, in Tampa, Florida. If a contest falls within one-quarter of a percentage point, another recount is ordered — this time to inspect by hand any ballots considered undervotes or overvotes. In such cases, a machine tally may suggest that the voter merely skipped a contest or marked more than one selection. If the voter's intentions are clear in a review, the ballot will be counted. The Senate race looks almost certain to receive such scrutiny, with Scott leading Nelson by about 12,500 votes, or 0.15 of a percentage point, in the unofficial vote results. The governor's race, however, may not reach the threshold for a hand recount. Democrats have filed lawsuits asking a federal district court in northern Florida to stop the state from rejecting ballots when voters' signatures do not match the records on file. Democrats also want a longer window for vote-by-mail ballots to arrive at elections offices and still be counted. Will Florida's recount affect either party's national power? The person elected governor in Florida will have the power to sign or veto the congressional district maps that will be drawn after the 2020 census. Florida's clout in the U.S. House of Representatives is expected to grow, and how the district lines get settled could shape the partisan split for the coming decade. This year's uncommonly tight elections in Florida also could be a harbinger of the fight for the state's electoral votes in the 2020 presidential election. Trump, who owns property in Florida, won the state in the 2016 presidential election, after Democratic President Barack Obama carried it twice. Without a repeat victory in Florida, the largest of the states to swing between parties in presidential elections, Trump's path to re-election narrows significantly.